The new year will soon be upon us, and what better time to be able to get rid of your old stuff and buy some beautiful new things to brighten up your home. 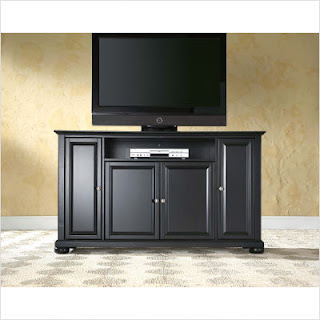 For example, how about flat screen TV stands? The good folks over at CSN have once again offered me the chance to hold a giveaway on my blog and one lucky person will win a $45 CSN Gift Certificate to help make your New Year's wish come true. Contest ends Friday 12/31 at 11:59 PST. Good luck! There are just certain recipes that tend to scare cooks/bakers more than others due to the fact that there are just so many problems inherent in the process. 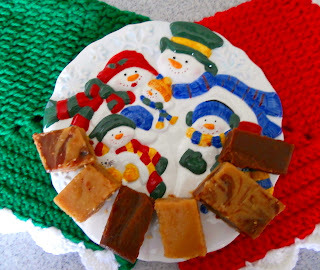 Take for example bread, caramel, or (my personal fear) homemade fudge. So, you can imagine my glee when I encountered Tracy's fudge recipe on her blog, "Midwestern Girl with a Texas Address," while participating in the 12 Weeks of Christmas Cookies group. As you probably know, most fudge recipes require you to use a candy thermometer, wait for that magical temperature, and add things in at just the right moment, all the while worrying about things like graininess and crystallization of the sugar. But, not Tracy's. With just a few ingredients and a method that's as easy as 1-2-3, I found myself staring at an entire panful of glorious, mouthwatering, REAL fudge. Her recipe is especially good because it allows you to make several types of fudge all at once. I made her chocolate version, the peanut butter version, and combined both of them for a chocolate-peanut butter marbled version as well. The plain chocolate one was a little sweet for me, so I might use bittersweet chocolate chips next time instead of the semisweet for a deeper, darker flavor. The peanut butter, however, was spot-on perfect. It was so creamy and had just the right amount of sweetness. As for my sister, she loved the marbled version. I'm sure that if you try this fudge for yourself, one or all three will be your favorites as well. Heat ingredients until smooth. For peanut butter fudge, add 1 cup peanut butter to mixture. For chocolate fudge, add a cup of chocolate chips to mixture and heat until melted and smooth. Pour mixture into 8" greased pan and refrigerate until cool and able to cut into bite sized pieces. The Orglamix Organic Makeup Giveaway was a big success. Thank you to all those who entered. The winner is #193 Camelia. Congratulations Camelia!!! An e-mail has been sent to the winner. I will also be holding a Christmas giveaway starting this Tuesday for a CSN gift certificate, so don't forget to check back on my blog at that time for a chance to enter. Well, all good things must come to an end. After nearly three months, we are on the final week of our 12 Weeks of Christmas Cookies group. It has been a wonderful time for me. I found so many new and delicious recipes, tried and loved them, and got to know an amazing group of talented, kind, and awesome bloggers. A big thanks to April for starting the ball rolling and allowing us all to have this memorable opportunity. They say that chocolate releases endorphins and you become happier as a result. So, I can think of no better way to raise my spirits than to share a delicious chocolate treat with you all. They're called Avalanche Bars. I found them on Cookies and Cups' website. They are originally made with white chocolate and peanut butter. But, being a dark chocolate kind of girl, I changed the recipe to suit my own tastes. I used a combination of dark chocolate and butter and added chopped up pretzels and marshmallows to the mixture. To top them off, I used some chocolate covered toffee bits. I also made them in a silicone muffin tin instead of a pan. It worked out so well. Not only did they pop out perfectly without a fight, but they also had a cute little shape to them, just perfect for a handheld treat. SALTY/SWEET from the pretzels and chocolate. So, although this baking event is coming to a close, you don't have to feel sad. Make these Avalanche Bars and get happy! Lightly grease a 9x9 pan. In a microwave-safe bowl, dump in chocolate chips and heat on medium power for 1 minute. Stir and continue in 30 second increments until chips are melted. Combine the butter with the melted chips. Add the Rice Krispies. Let cool a little and add the marshmallows. Press into the pan and spread evenly, pressing lightly with the back of a spoon, but do not compact too much, otherwise they will get hard. Top with toffee bits. 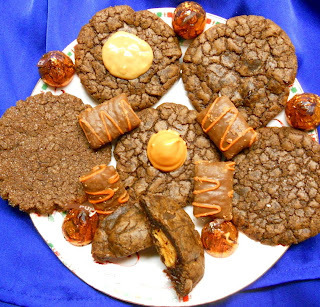 You can also use peanut butter in place of the butter and substitute any candies or mix-ins you wish. I noticed that the chocolate tended to seize when I added in the butter (there was no water anywhere so I'm not sure why this happened). To fix this, I stirred in a little oil and it softened up again. I have a whole lot of other variations of this recipe that I intend to try one day. Well, I finally finished my pumpkin quest (at least until next year) and have now shifted gears into holiday mode. To kick it off, I made Martha Stewart's gingerbread snacking cake. Just the scent of it alone is heavenly and, like all spicy baked goods, the aroma and flavor deepens the day after you bake it (so if you can exercise a tiny bit of patience, it will be worth it). It's the kind of treat that just says, "Christmas." Even more importantly, it's delicious. I took it to my church's "Break the Fast" activity and the people there ate it up. I would definitely recommend putting the white chocolate on top. Not only does it look pretty, but it really adds something to the flavor of the cake and makes it twice as good. On another note, I'll be celebrating my birthday tomorrow. While I won't say how old I'll be, I will say that I'm one year closer to thirty. Hopefully, that means I'm a year wiser too. Heat oven to 350 degrees. Butter and flour a 9-by-13-inch cake pan; set aside. 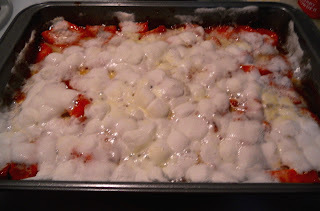 In a bowl, combine boiling water and baking soda; set aside. In a large bowl, sift together flour, ground spices, salt, and baking powder; set aside. In an electric mixer with the paddle attachment, cream butter until light. Beat in brown sugar until fluffy. Beat in molasses and grated ginger, baking-soda mixture, and flour mixture. Beat in eggs. Pour batter into prepared pan; bake until a toothpick inserted in center comes out clean, 30 to 35 minutes. Let cool on a wire rack. 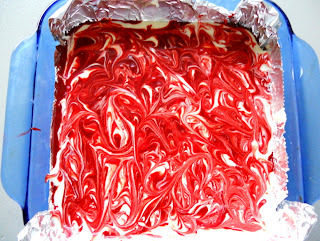 Cut into squares and decorate with the melted white chocolate. Well, I did it. 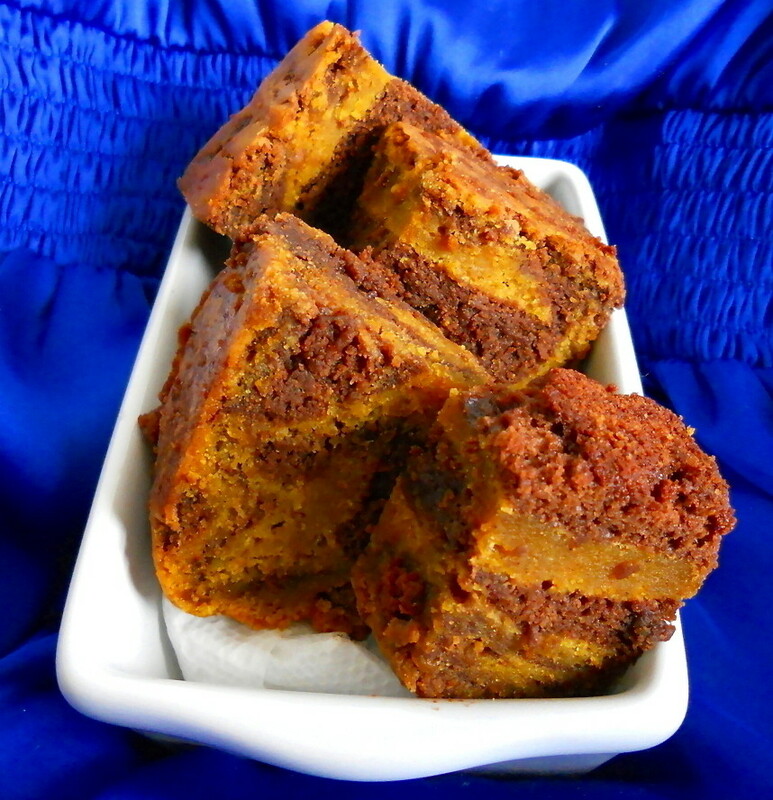 I finally got around to making these pumpkin swirl brownies that I've seen on so many blogs. What can I say? All of you who made this finally convinced me. I can't say that it was the easiest recipe I've ever put together. For one thing, it requires you to mix up two different batters in addition to making the pumpkin and chocolate mixtures that go into them. Consequently, my sink was full of used bowls that now needed to be washed. I also wish that I had read the reviews of other people before making these brownies. If I had, I would have known about the problem that occurs in baking these up. Here's the thing, this recipe makes a LOT of batter but directs you to pour it all into a small 9-inch pan. I did so and found that the entire middle section of the pan was still incredibly gooey even after baking it for the specified 45 minutes. No, not good gooey, completely batter gooey. So, I ended up baking it for half an hour longer which helped the center bake up but also made the edges way too dry instead of moist and chewy. I realized afterward that a 7x11 pan would have been a much better idea. But, you ask, was it still worth it? Oh YES. The chocolate brownie part was fudgy, rich, and delicious. 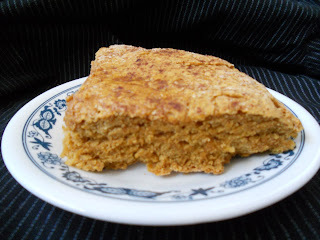 The pumpkin portion was chewy and dense and I think it could stand alone and be an excellent pumpkin blondie. Together, the pumpkin and chocolate worked really well together and the swirled look was just really pretty. The only thing that disappointed me was that I couldn't taste the cayenne pepper in these brownies and I had been looking forward to that nice spicy kick. So, the next time I make these, I'll probably add 1/4 teaspoon more of cayenne pepper to the brownie batter. But, other than that, this was definitely a keeper. Preheat oven to 350F. Butter a 9-inch square baking pan or dish (I'd recommend using a 7x11 rectangular pan). Line bottom of pan with parchment paper, butter lining. Melt chocolate and margarine in a heatproof bowl set over a pan of simmering water, stirring occasionally until smooth. Whisk together flour, baking powder, and cayenne pepper in a large bowl; set aside. Put sugar, eggs, and vanilla in the bowl of an electric mixer fitted with the paddle attachment; beat until fluffy and well combined, 3-5 min. Beat in flour mixture. Divide batter between two medium bowls (about 1 1/2 c. per bowl). Stir chocolate mixture into one bowl. Stir the pumpkin, oil, cinnamon, nutmeg, and ginger into the other bowl. Transfer half of chocolate batter to prepared pan, smoothing top with a rubber spatula. Top with half of pumpkin batter. Repeat to make one more chocolate layer and one more pumpkin layer. Work quickly so batters don't set. With a small spatula or table knife, gently swirl the two batters to create a marbled effect. Bake until set, 40-45 min. Let cool in pan on a wire rack. Cut into 16 squares. I am so excited about this giveaway. For one thing, I've just reached 200 followers! Secondly, my birthday is coming up in a week. So, as a way to celebrate all of that, and say "thank you" to all of you for making my blog so special, I've decided to give one of you a very special gift from Orglamix Organic Mineral Makeup. What's that you say? This is a food blog? Well, that's true. But, I also know that no matter how much we all love spending time in the kitchen, we do eventually have to leave it, if only for a short time. And, when I do, I know I like to dust the flour off my face and put on some makeup instead. 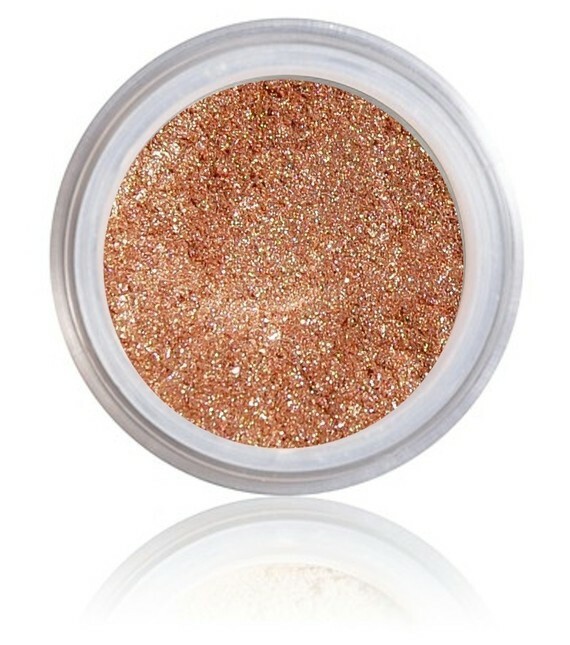 In case you haven't heard about it, Orglamix is becoming one of the hottest makeup sellers around. It makes the most gorgeous eye shadow colors, not to mention blush, foundation, and more. Plus, the best part is that it's all organic. Really, it doesn't get any better than this. Buy It: All Orglamix products can be purchased directly from Orglamix's Etsy shop at http://www.etsy.com/shop/orglamix. Win It: Cheri, from Orglamix, has agreed to give the winner of this giveaway not one, not two, but THREE colors (your choice) from the following formulas: Pure Organic Mineral Eye, Blush, Glow, Foundation, or Color Corrector. How great is that? So, if you want to win this super prize, make sure you follow the entry requirements below. Thanks so much Cheri and good luck to all of you! Rules: This giveaway is open to everyone (US, Canada, and international). Any entry that does not conform with the rules below will be deleted. A winner will be chosen by random.org and will be notified by e-mail shortly thereafter. The winner will have 48 hours to respond or a new winner will be chosen. You MUST be a follower of my blog in order to enter. To follow me, just go to the Google follower on the right and sign in. If your e-mail address is not included in your Google profile, please include it in your comment so that I will know how to contact you. Optional Entries: You can earn extra entries by doing any or all of the following after you have completed the mandatory entry. Leave a separate comment for each one that you do. Follow Orglamix on Twitter by clicking here. Please include your Twitter username in your comment. (1 entry). Contest ends on Saturday, December 18 at 11:59pm PST. Good luck!!! Week 10 already? We're really flying. I just can't believe Christmas is right around the corner. 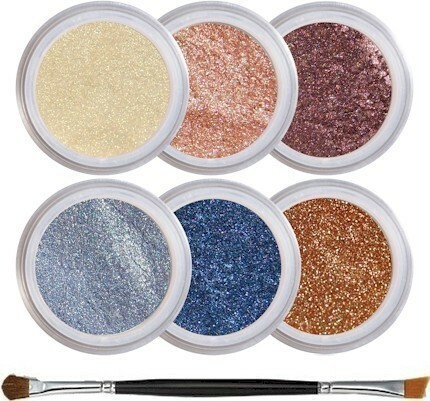 Speaking of Christmas, I'll be having a great giveaway starting tomorrow for Orglamix makeup. 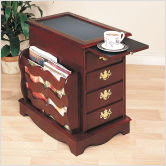 It would make a great gift for someone or, if you want to gift yourself with it, be my guest (I'd do the same). Thank you also for all your congratulations last week. I felt so loved. 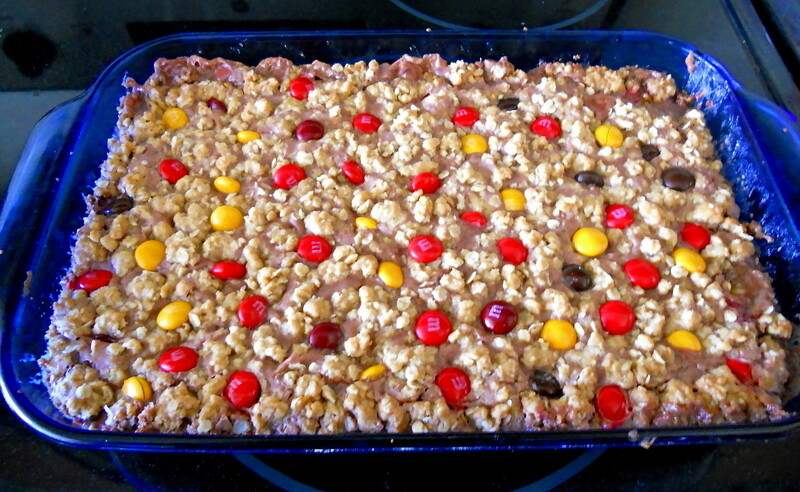 For my pick this week, I made these Festive Oat and Candy Cookie Bars. After seeing them at Louanne's Kitchen, I just couldn't resist. I'm definitely glad I gave in to the temptation because these bars were everything she said they would be. They were gooey and chocolatey and yummy to the very last bite. Like Louanne, I made these with M&Ms because that's what I had on hand. I also like how the M&Ms give the bars a really festive look for the holidays. But feel free to use other types of candies too if that's what you have in your pantry. According to Louanne, Snickers, Almond Joy, and Twix are all heavenly as well. One word to the wise - she recommends lining the pan with parchment paper. So, what's wrong with the picture below? Yup, I thought I could get away with simply greasing the pan. I realized what a mistake that was later on when I had to practically chisel my bars out of it. Lesson learned. Preheat oven to 375 degrees. Butter or spray a 13x9 pan, then line with parchment paper, so that paper extends over long-side of pan; set aside. Mix oats, flour, pecans, brown sugar, baking soda and salt together. With the mixer on low, slowly drizzle melted butter into oat mixture; mix until crumbly. Remove 2 cups of mixture and pat remaining mixture into prepared pan. Bake crust for 10 minutes, then remove and allow to cool; lower oven temperature to 350 degrees. Melt 1 cup of the M&M's in the microwave for about 60-90 seconds; remove and combine with condensed milk, stirring well. Pour over crust and set aside. 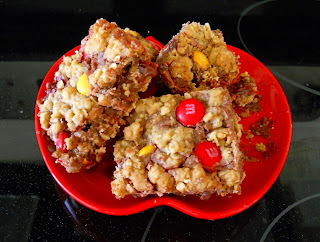 Combine reserved crumb mixture with reserved 1/2 cup of M&M's; sprinkle over M&;M and condensed milk mixture. Bake for 28-30 minutes at 350 degrees. 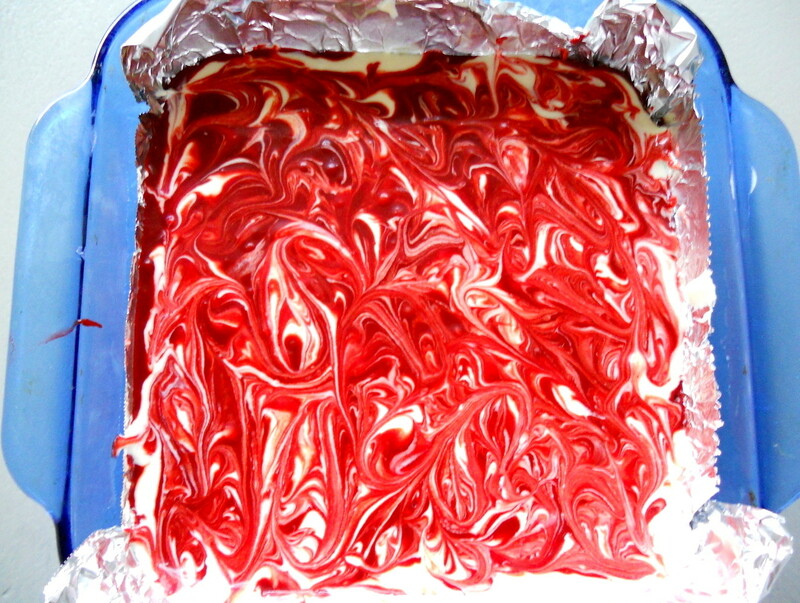 Allow to cool completely before cutting into squares. Note: I'd definitely recommend chilling these bars overnight in the fridge before cutting them. If not, they'll be a little too gooey and won't hold their bar shape very well. I hope you all had a delicious and memorable Thanksgiving. It was wonderful being able to spend Thanksgiving with my family. It was sort of thrown together at the last minute, so we just had a roasted chicken instead of a turkey this year. Also, forgive me, but the stuffing and mashed potatoes came out of a box. What can I say? For us, that's traditional and nothing else will do. All told, it was a Thanksgiving filled with food, fun, and family. In short, perfect. 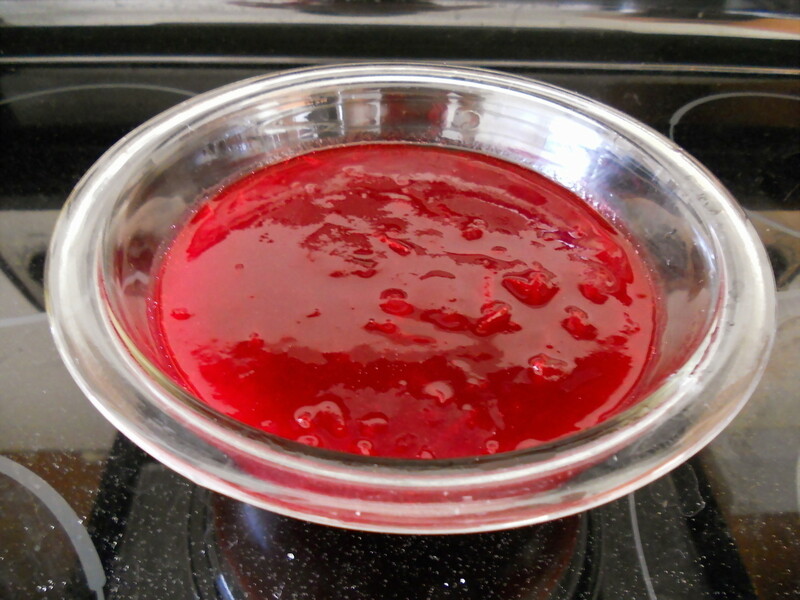 In a medium sized saucepan over medium heat, dissolve the sugar in the water. Stir in the cranberries and cook until the cranberries start to pop (about 10 min.). Remove from heat and place in a bowl. The sauce will thicken as it cools. Parboil the yams until you can pierce the outside with a fork. You don't want the fork to go all the way through, you just want them soft enough so you can peel them easily. Cut the yams into about 6-8 pieces each. Arrange the yams in a single layer in a baking pan. 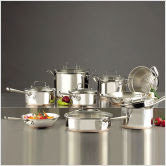 Combine all the other ingredients in a saucepan over medium heat, and bring to a boil, stirring constantly. Continue cooking the mixture until it thickens to the point that it can coat the back of a spoon. Pour it over the yams in the pan and bake at 400F until the yams are tender, about 30-45 min. To finish it off, top with marshmallows and put it back in the oven for a few minutes until the marshmallows are melted. Pour the warm water in to a medium bowl and whisk in the yeast (I also added a pinch of sugar). Let sit until frothy, about 10 min. Whisk in the honey, oil, and pumpkin puree. Whisk together the flour and the salt. Make a well in the center of the dry ingredients, then pour in your wet ingredients. Using a rubber spatula, pull all the ingredients together. When you can no longer mix, use your hands to start kneading the dough. Knead the dough until it comes together in a smooth and elastic ball, adding flour as necessary to prevent sticking. Lightly oil another large bowl and put your dough ball inside it -- flipping over once to coat both sides lightly with oil. Cover with a damp towel or plastic wrap and let rise for about 2 hours or until nearly doubled in size. Preheat oven to 425F and divide the dough into two equal pieces. You can freeze half the dough at this point if you want or store it in the fridge if you plan to use it the next day. Tear off sections of the dough (2 Tbsp. at a time) and roll them into a long snake shape. Tie that snake into a knot. Set aside and continue with the rest of the dough. Once you've made all your knots, put them onto your baking pan and let bake until golden brown on the tops, about 10-15 min., depending on the size of the knots. It's now Week 9 of the 12 Weeks of Christmas Cookies. Hard to believe that it'll already be December next week. The time has gone by so quickly, but I've had an extremely fun time baking along with this group. I've mentioned before that my mother loves red velvet cake with cream cheese frosting. 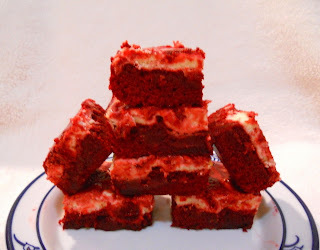 Once, when I went home for Christmas break, I baked three red velvet cakes in three weeks (and yes, they all got eaten). So, when I saw this recipe on Moogie and Pap's site, I just knew I had to make them, especially since my mother would be spending Thanksgiving with me. Their beautiful red color makes them perfect for the upcoming Christmas season, but they taste so good, you'll want to make them all year round. As for the good news, I just found out last week that I passed the California Bar Exam!!! I was so thrilled that I let out a loud whoop when I saw my name on the computer screen (hope the neighbors didn't hear me). It's such a relief after all these months of waiting for the results (the exam was in July). It was definitely something to be thankful for this Thanksgiving. Preheat oven to 350 degrees F. Butter an 8 by 8-inch baking pan, and set aside. Brownie layer: Add melted butter to a large bowl and add the sugar, vanilla, cocoa powder, salt, food coloring, and vinegar, in that order, mixing between additions. Whisk the eggs in a small bowl and stir it into the cocoa mix. Fold in the flour until lightly combined. Pour the batter into the prepared baking pan, saving 1/4 cup of the batter for the top. Note: I'd recommend chilling these bars. I think they become even better this way. Yes, I'm still on my pumpkin kick, at least for a little while longer. After all the sweets, however, I thought I'd share something a little well, not so much savory, just not nearly as sweet. So, I decided to make this pumpkin soda bread. I've made Irish soda bread many times before and loved it. I think it's great that you can get up in the morning, whip this up, and have a crusty loaf of freshly baked bread for your breakfast and all in under an hour. So, considering the pumpkin trip I was on, I could not resist when I saw this recipe for a pumpkin version of it. I did make a couple of changes to the recipe. I used a mixture of vinegar and milk instead of regular milk since the baking soda needs an acid to react with if the bread is going to rise. Buttermilk would work the same way if you wanted to use that instead. I also sprinkled my loaf with cinnamon-sugar before baking since cinnamon goes so well with pumpkin and I wanted my bread to have a touch of sweet. The finished loaf was perfect (even if it doesn't photograph that well). The pumpkin turned the bread a gorgeous orange color. As for the flavor, the pumpkin was not a strong presence, but at the same time, it gave the bread a really special taste that I absolutely enjoyed. Granted, this may not be the most authentic version of soda bread but I guarantee that it is the most delicious version you will ever eat. Preheat the oven to 400F. Line a baking sheet with parchment or a nonstick liner (or lightly grease) and set aside. Combine the flour, brown sugar, baking soda, cinnamon, and salt. Whisk together the pumpkin puree and milk. Add the pumpkin-milk mixture to the dry ingredients and stir until combined. Knead a few times by hand (the dough will be a bit sticky), then shape into a loaf and place on the baking sheet (I lightly dusted my baking sheet with flour). Score the loaf with a sharp knife in the shape of an "x". As I mentioned in my other post, I have a sort of "Pumpkin Bucket List" going on with all the pumpkin recipes I want to make. 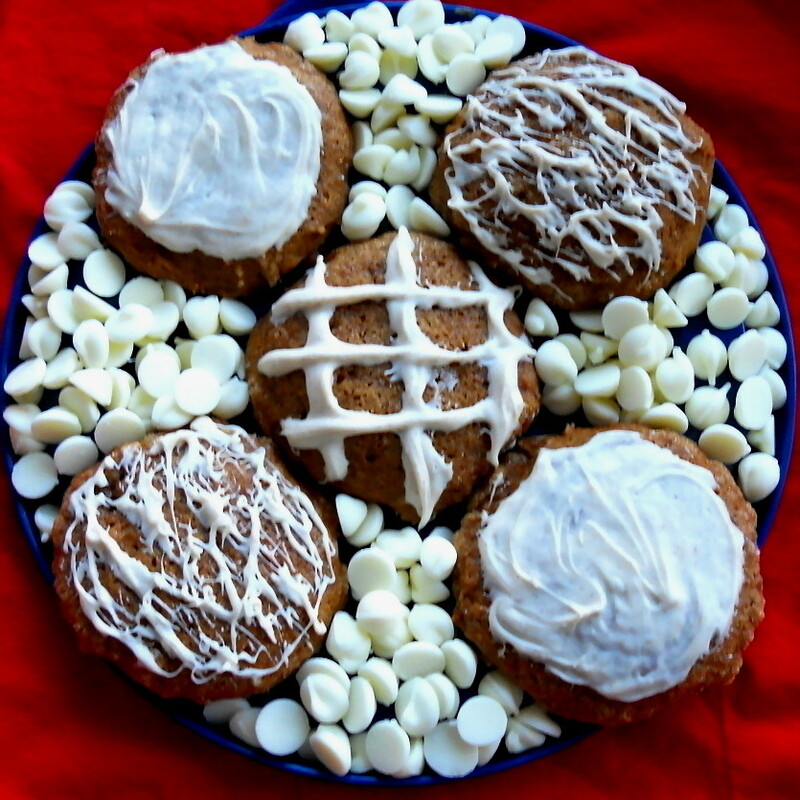 So, today I decided to make the Pumpkin Gingerbread and the Pumpkin Molasses Cookies. The pumpkin gingerbread recipe makes a lot. I halved the recipe and still got three rather large-sized mini loaves. The bread has a nice tight crumb to it and a delightfully crunchy crust on the top. Unfortunately, the taste was not what I was hoping for. I was really wanting that ginger flavor to shine through, but instead what I got was your every day pumpkin bread. Of course, there's nothing wrong with that. I still went ahead and devoured a couple of pieces. I'm thinking that I might have to just use all ginger in this recipe and maybe add some crystallized ginger to it as well. It's worth playing around with. As for the pumpkin molasses cookies, I was also thinking that they might have that gingerbready flavor to them as well, but I just couldn't detect it. In an effort to spice up the flavor of the cookies, I drizzled some of the with melted pumpkin spice kisses and others of them with some melted white chocolate to which I had added ginger and cinnamon. That helped to improve the flavor a bit. I still have some of the batter left too and am considering rolling them in a mixture of ginger and sugar before baking them. 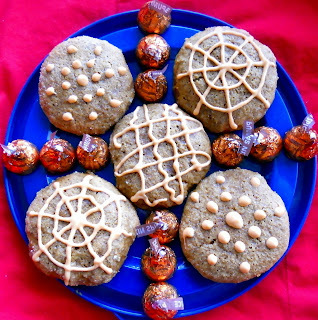 Of course, as with all spice cookies, the flavor tends to deepen over time, so I'll have to taste them again in a day or two. But, the search for a great pumpkin gingerbread cookie is still on. As for Pupkin, well, he just cares about one thing. Preheat oven to 350F. Lightly grease two 9x5 inch loaf pans. In a large mixing bowl, combine sugar, oil, and eggs. Beat until smooth. 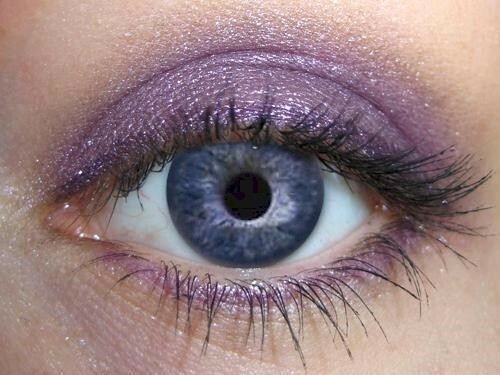 Add water and beat until well blended. Stir in pumpkin, ginger, allspice, cinnamon, and cloves. In medium bowl, combine flour, soda, salt, and baking powder. Add dry ingredients to pumpkin mixture and blend just until all ingredients are mixed. Divide batter between prepared pans. Bake until toothpick comes out clean, about 1 hour. Note: I didn't realize that the recipe said to add water, so I inadvertently left this out. However, I don't see why you would need the extra moisture since the bread's texture is perfectly fine without it. Beat the butter on medium speed until smooth and creamy. Add the brown sugar, molasses, and pumpkin puree and beat for 2 min. Add the egg and beat for 1 min. more. Reduce the mixer speed to low and add the dry ingredients, mixing until the flour and spices disappear. You will have a very soft dough. Divide the dough in half and wrap each piece in plastic wrap. Freeze for at least 30 min. or refrigerate for at least 1 hour. The dough is sticky, so the longer time it can chill, the easier it is to work with. Bake the cookies for 12-14 min. or until the top feels set to the touch. Let cookies cool 5 min. on the sheets before transferring to cooling rack. 1) Katrina of "Baking and Boys" - Katrina's anecdotes always bring a smile to my face and she has the magic chocolate touch when it comes to her baked goods. 2) Tracy of "Midwestern Girl with a Texas Address" - Tracy just recently started up her blog, but from the looks of her yummy creations, she's off to a great start. 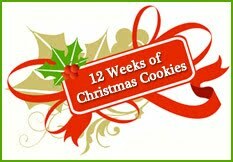 3) April of "Abby Sweets" - Thank you for hosting the "12 Weeks of Christmas Cookies" and for letting me be a part of it. As a result, I've gotten to know so many other wonderful bloggers. 4) Steph of "Bite by Bite" - Thanks for inspiring me both in and out of the kitchen. 6) Erin of "EKat's Kitchen" - Erin and I have gotten to be "best blogging buddies," so her kitchen is definitely someplace I'd want to be as she cooks up her latest creation. For those of you who don't know, she hosts a "Friday Potluck" linkup every week and anyone can join in on the fun. 7) Cute Kitty Punk of "Sweet Rolls that Rock" - Her blog is dedicated to coming up with new amazing combinations and flavors for sweet rolls. Now that rocks! 8) Emily of "Sugar Plum" - Emily's creativity and intuition in the kitchen never fail to astound me. No matter what kind of treat she invents, you know you're gonna want some of it. 9) Lizzy of "That Skinny Chick Can Bake" - Boy can she ever and she also cooks marvelously too. 10) Manu of "Dessert First" - I love that she's Brazilian and is able to share her country's best recipes. 11) Kimberly of "Bugaboo, Mini, Mr., and Me" - Kimberly is an absolute superwoman. Family, food, and crafts, she does it all and she does everything well. 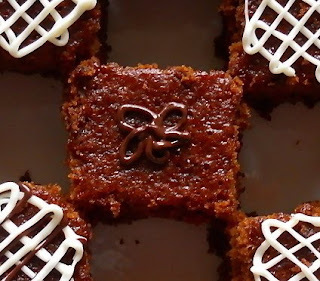 12) Aipi of "US Masala" - If you're craving food with an exotic taste, you must head over to her blog. With her spicy curries and other Indian recipes, your search will be over. 13) Sue of "Munchkin Munchies" - Sue's blog is absolutely adorable and her treats are no exception. 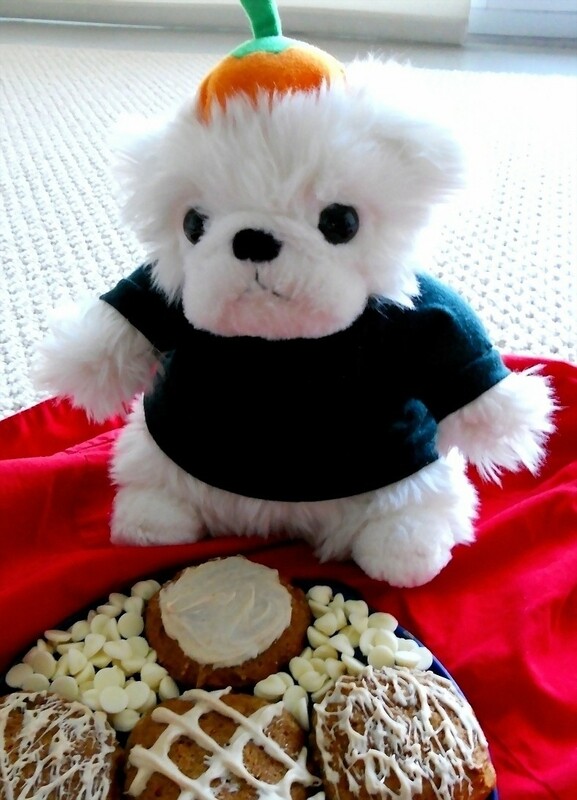 If you're ever in need of a cute-looking cookie, you'll find what you're looking for there. 14) Reeni of "Cinnamon, Spice, and Everything Nice" - Reeni's blog title exactly describes her and the recipes that you'll find there. 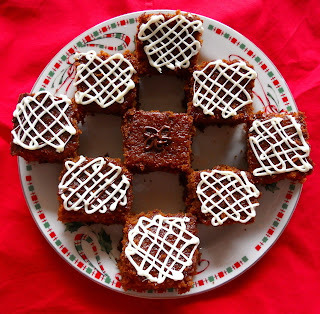 It's no surprise that she's also come very far in the Project Food Blog competition. 15) Lina of "Crustabakes" - Lina's treats look like they belong in a bakery display case. Seriously, have you seen the beautiful cakes she makes and decorates for people? I wish I was one of those lucky recipients. 16) Tracy of "Sugarcrafter" - Tracy is another creative force in the kitchen and the results of her ingenuity are fantastic. 17) Marie of "The English Kitchen" - Marie really does live in England (lucky) and shares mouthwatering recipes from across the pond. 18) Cara of "The Boys Made Me Do It" - If her boys are the driving force behind her food, then she's definitely got something going for her because she's always making something delicious. 19) Peggy of "My Fiance Likes It, So It Must Be Good" - The food that Peggy makes and showcases on her blog is good, no doubt about it. If you visit her site, I guarantee you'll think so too. 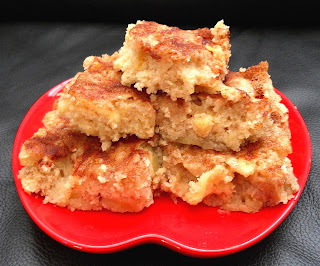 20) Stephanie of "Macaroni and Cheesecake" - One look at her cinnamon apple streusel bars or her caramel apple kiss blondies and you'll want to return to her site again and again. 21) Avril of "Baking and Creating with Avril" - After seeing her recipes, you'll want to bake and create along with her too. Her site is neat because she shows a picture of the ingredients she used for each recipe so you can be sure you won't forget anything. 22) Megan of "Megan's Cookin'" - Megan's got recipes for everything no matter what you're looking for whether it be a dessert, a quick dinner, or an elegant appetizer. There's something for everyone on her site. 23) Megan of "What Megan's Making" - The pictures Megan takes of her food are just tempting. I dare you to take one look without next running to your kitchen to make it yourself. 24) Chels and Sues of "We Are Not Martha" - This fun duo will wow you with their culinary feats and amuse you with their stories. Best of all, they show a lot of photos detailing the process so you can recreate their dishes as well. 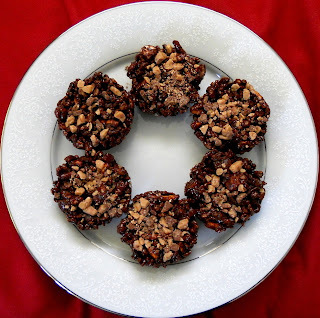 25) Lee Ann of "C'est si Bon Sweets and Treats" - Lee Ann's blog is also very new but she already has a lot of tasty looking recipes to share. I look forward to seeing many more of her successes in the kitchen. 26) Mickey of "Monster Mama" - Mickey has a wonderful flair not just for creating delicious treats, but also for making them look extra pretty. If you visit her site, you'll see just what I mean. 27) Nancy of "Spicie Foodie" - The food Nancy makes on her blog just pops with color making it a true feast for the eyes as well as for the palate. Plus, she is now hosting a link-up called, "Your Best Recipes," where YOU get to link up your very best recipe each month. So drop her a line to showcase your stuff. 28) Jacqueline of "Purple Chocolat Home" - Jacqueline's photos are just stunning. Her food shots will entice you and her nature shots will make you stare in wonder. Everything about her blog will literally take your breath away. 29) Katie of "This Chick Cooks" - Katie's food just reminds you of home. It's easy to make, delicious, and comforting all at the same time. 30) Raina of "The Garden of Yum" - Raina makes any recipe look easy. Whether it's making pizza dough or molding cookies, she takes the intimidation factor out of it and even I believe that I could get my results to look as good as hers do. 1. Accept the award and post it on your blog together with the name of the person who has granted the award and his or her blog link. 2. Pass the award to 15 other blogs that you love. I hope you'll all get the chance to visit these wonderful blogs and enjoy everything that they have to offer. They'll make your life delicious too. Pumpkin Spice Thumbprints and a CSN Winner!!! I seem to be going a little pumpkin crazy this year. Every time I read people's blogs, I keep seeing new and delicious looking pumpkin recipes that I simply have to try. As it is, I'm dying to try the Pumpkin Molasses Cookies from My Baking Addiction, the Pumpkin Biscotti from My Recipe Finds Online, the Pumpkin Gingerbread from Allrecipes, and Martha Stewart's Pumpkin Swirl Brownies (which I know a lot of you have made). Consequently, I'll probably be turning out pumpkin goodies till the New Year. What can I say, I love pumpkin. I may turn orange but it'll be worth it. 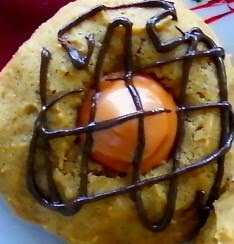 These Pumpkin Cookies were something that especially caught my eye. 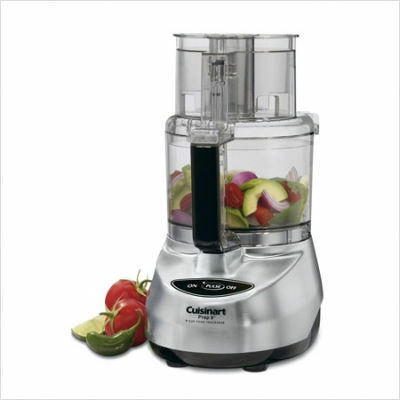 It's received over 1500 good reviews on Allrecipes. Well, with a glowing commendation like that, how could I not try them. 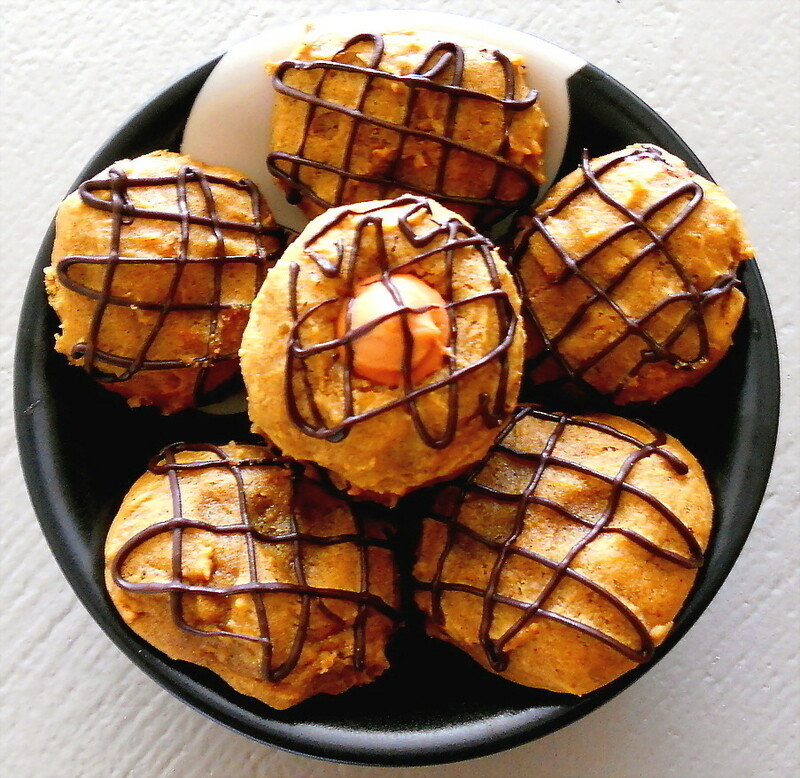 The cookies came together like a dream and soon I had little fluffy pillows of sweet, spicy, pumpkiny goodness. I decided to forgo the icing and instead jazzed things up by adding cinnamon chips or chocolate chips to several of the cookies. I also made pumpkin thumbprints by putting some Hershey's Pumpkin Spice Kisses into the cookies while they were still warm. Then, as a nod to Katrina from "Baking and Boys," I melted some semisweet chocolate chips, added some pumpkin pie spice to it, and then drizzled it onto the cookies. For those of you who don't know Katrina, she always finds a way to add her signature chocolate touch to her treats and it never fails to make the results even better. This time was no exception. The chocolate drizzled pumpkin spice thumbprints were the best of the bunch. Just heavenly!!! I hope you've still got some of those Kisses lying around your house because you'll definitely want to make these cookies. There were over 200 entries to the CSN giveaway. Thank you to all those who entered for making my first giveaway such a special and successful one and thank you to CSN for sponsoring it. And now, for the moment you've all been waiting for, the winner of the CSN giveaway is #29 Tanya from Dreams, Diapers, and Dilemmas!!! Congratulations Tanya! An e-mail has been sent to the winner. In a medium bowl, cream together the 1/2 cup of butter and white sugar. Add pumpkin, egg, and 1 teaspoon vanilla to butter mixture, and beat until creamy. Mix in dry ingredients. 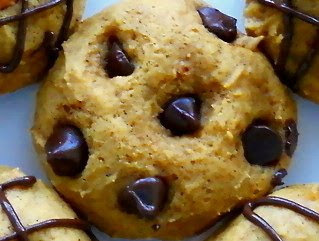 (If desired, you can add some cinnamon chips or semisweet chocolate chips to the dough). Drop on cookie sheet by tablespoonfuls; flatten slightly. 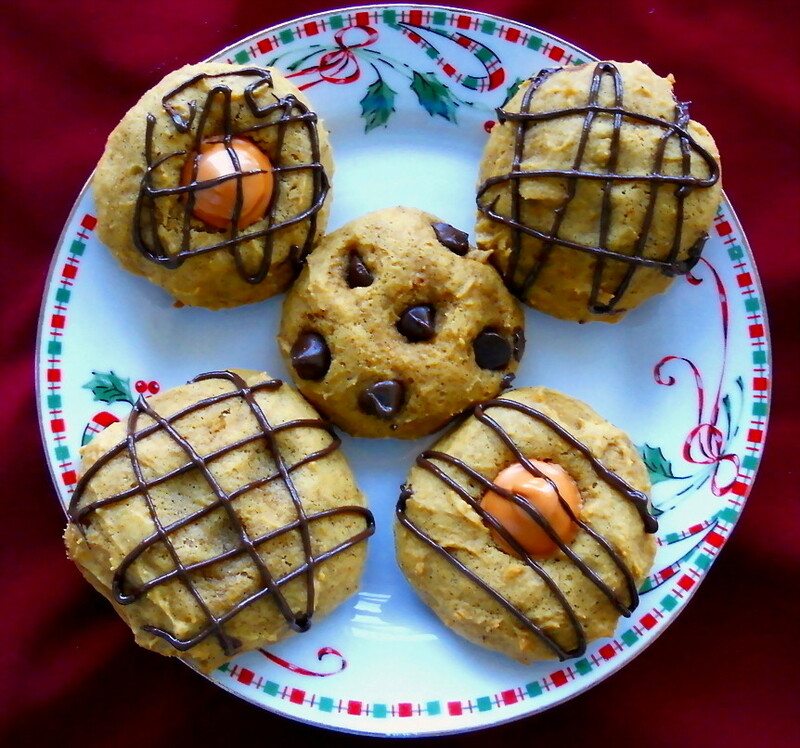 To make pumpkin spice thumbprints, omit the cinnamon chips/chocolate chips from the dough and press Hershey's Pumpkin Spice Kisses into the baked cookies while they're still warm. Melt some semisweet chocolate chips. Add a little pumpkin pie spice to the melted chocolate if desired, according to your taste. Pipe some of the melted chocolate onto the pumpkin thumbprints after they have cooled a bit. Hey, check it out. I'm guest posting today on MelissaStuff's website about these "Sparkling Cocoa Drops" with endless variations. The post is on "Easy, Cheap Christmas Gifts," and naturally, my idea for this was to make cookies as presents. Every single one of these cookies is delicious, so head on over to read all about them - http://www.melissastuff.com/2010/11/guest-post-easy-cheap-christmas.html. It's amazing how fast this week went by. Before I knew it, it was Thursday and I realized I hadn't yet made my cookies for this week. I still figured I had time though to make them and post them on Thursday night. No worries, right? There was only one problem, I was out of flour. So, I headed over to my local grocery store, saw that flour was on sale for $0.99, and . . . saw that it was all gone. Oh well, so much for making the cookies on Thursday night. As a result, I had to go back to the store this morning, luckily found that the new shipment of flour had arrived, and began baking. If I only knew that the flour was the least of my troubles. 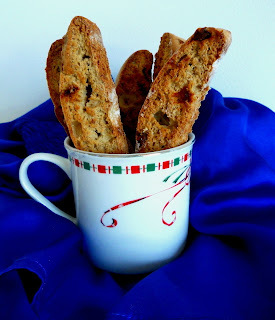 I decided to make the Cinnamon and Banana Bread Biscotti from Picky Palate's site. I had my eye on this recipe for quite a while but didn't have the cinnamon chips for it until now. So, the time had come. I began making the biscotti dough. That's when I encountered my second problem. The "dough" in my bowl was not dough at all. It was more like really thick cake batter. How in the world was I supposed to shape this into logs like the recipe stated? I'm not sure what went wrong, or if this actually is the way it's supposed to be. The recipe said to add the wet ingredients to the dry, but I did it the other way around. Does anybody know if that would make so much of a difference? I wouldn't think so, but you never know. I did the only thing I could to try and fix this. I added more flour, about a cup more. The dough looked a little better but was still very wet and sticky. So, I stuck it in the freezer hoping that it would reach some sort of moldable state. That seemed to do the trick and I was able to get two logs onto a cookie sheet and start baking. That's when I encountered my third problem. I noticed that the texture of the biscotti seemed a little different from what I was used to. After the first baking and the toasting of the first side, the biscotti seemed more like country bread loaves than cookies. They also felt a little spongy. Again, maybe this is how it's supposed to be. After all, the title of the recipe does say "Banana Bread Biscotti." Thankfully, after the final baking and leaving them out to cool, they did crunch up considerably and resembled the biscotti that I'm familiar with. As for the taste, they do have a lot of wonderful banana flavor so I was pleased with that. 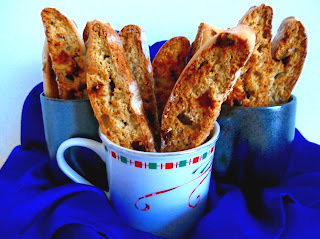 But, as for making them again, well, I think I'll stick with my tried and true biscotti recipes from now on. Combine bananas, egg, brown sugar, and vanilla in a bowl; mix until combined. In another bowl, combine the flour, sugar, baking powder, cinnamon, salt, and cinnamon chips. Add wet ingredients to dry until combined. Reduce heat to 250F (I set my oven on 325F). Place slices back onto cookie sheet and bake for 15 min. on each side or until crisped. (I've found that you get a more even crunch to your biscotti if you do a baking on each side instead of just one single baking on one side) Let cool completely. If desired, you can dip them in melted white chocolate like Picky Palate did, but I didn't have any so I just skipped this step. Steph's Bite by Bite blog must be seriously inspiring me because this is the second time I've made a recipe after seeing her post it on her blog. First, it was these Pumpkin Pie Bars/Brownies. 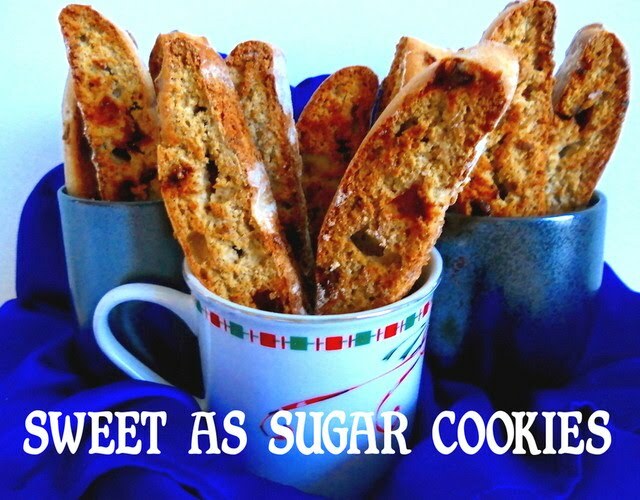 Now, it was her Spiced Oatmeal Shortbread Wedges. What can I say? Her stuff just looks good, really good. I did alter the recipe, however, based upon my own taste and limitations. I didn't toast the oats simply because I sort of missed that step when I was reading the recipe. Oops. Well, there's always a next time. I also increased the brown sugar and, since I like my cookies spicy, I increased the spices as well and added some cardamom. Then, since I don't have a food processor (I'm telling you, one of these days I'll get one), I cut the butter in by hand using a pastry cutter. It's just as effective, but it'll take a little longer. Finally, I used turbinado sugar on the top instead of regular sugar to add a little extra crunch. As I type this out, the cookies are baking in my oven right now and it smells incredible. The oats on top also give it a nice rustic look. The taste, at first, was incredibly subtle. I almost thought that maybe I should have tripled the spices. But, after letting the cookies sit for a day, the flavors had time to set and I could really taste that nice spiciness. I think I'd increase the sugar, just a little more, but these cookies are still a good change from the everyday shortbread. Note: My changes to the recipe are in blue. For the original recipe, just click on the title below. Preheat oven to 325F. 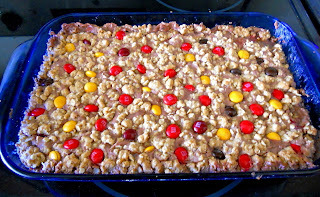 Spread oats out on a baking sheet and bake 6-8 min. until oats are light brown. Let cool completely. In a food processor, combine 1/3 c. cooled oats with the flour, brown sugar, and spices. Cover and process until oats are ground. Add butter pieces to food processor. Cover and pulse until mixture just comes together. Form dough into a ball. Pat dough into an 8" circle on an ungreased cookie sheet. If desired, make a scalloped edge. Brush dough lightly with milk (I omitted this). 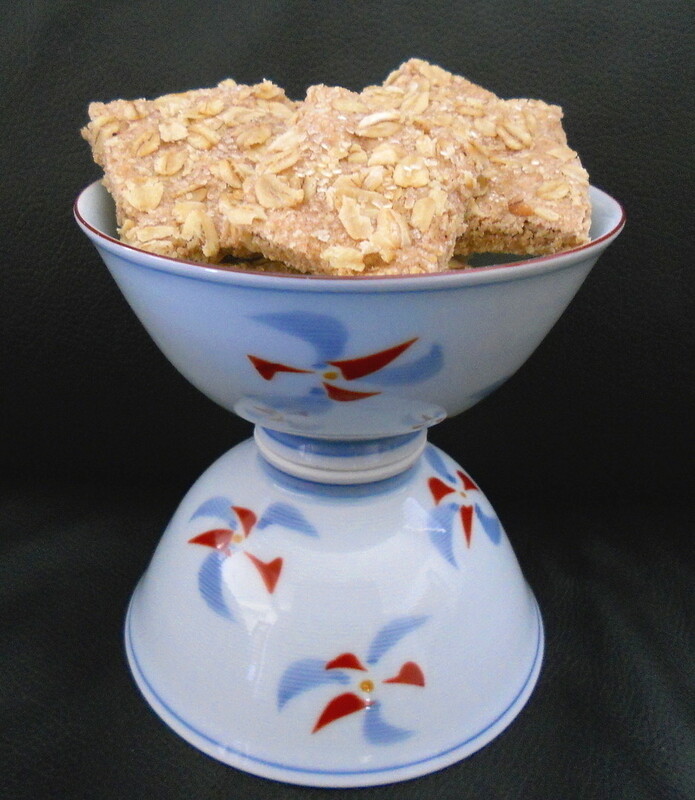 Sprinkle with the remaining oats and sugar; press oat mixture lightly into the dough. Cut into 10 wedges (leave in wedges in circle). Bake for 25-30 min. or until center is set. Recut circle into wedges while warm. Cool on cookie sheet for 5 min. Transfer cookies to wire rack and let cool. 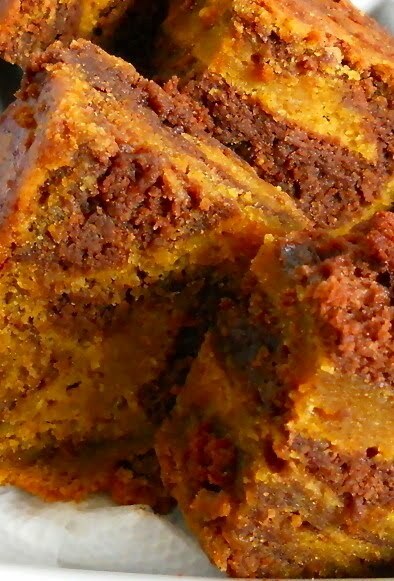 These past few weeks, I've been baking up a lot of things with pumpkin - cornbread, blondies, and even brownies. After all, 'tis the season. But, then I thought, why should pumpkin get all the credit? It's time to put apples back in the spotlight. So, I decided to make Apple Brownies. I found the recipe on the site, Gourmet Mom-on-the-Go. However, I did modify the recipe slightly to add even more flavor. Instead of using only cinnamon in the batter, I also added some cardamom. I don't know if that makes a big difference, but the bars certainly taste delicious so it doesn't hurt. If you don't have any on hand, don't worry about it. Cinnamon alone would still make great bars or you could swap in a little nutmeg or your own favorite spice instead of the cardamom. In addition, I added some cinnamon sugar to the top of the brownies. This, to me, is a definite must and I highly recommend it because, as I've said before, cinnamon-sugar makes everything better. Although, I'm kind of thinking that I might like these with a powdered sugar glaze too. Or, heh heh, a cinnamon powdered sugar glaze. Now we're talking. But, whether you sprinkle them, glaze them, or frost them, these bars will be absolutely amazing. They're cakey and extremely moist due to all the apples in the mix. They literally will melt in your mouth, I'm not kidding. Now you know this little secret - brownies do not have to be chocolate. Nope, apples can make some really good brownies too. By the way, don't forget to enter my giveaway for a $45 CSN gift certificate HERE. The giveaway will end on 11/14 so you still have a week to get your entries in. Preheat oven to 350F. Cream butter and sugar. Add eggs, flour, baking powder, cinnamon, cardamom, and apples. Mix well. Pour into a greased 9x13 pan. Sprinkle with cinnamon-sugar. Bake for 45 min. or until a toothpick inserted in the center comes out clean. 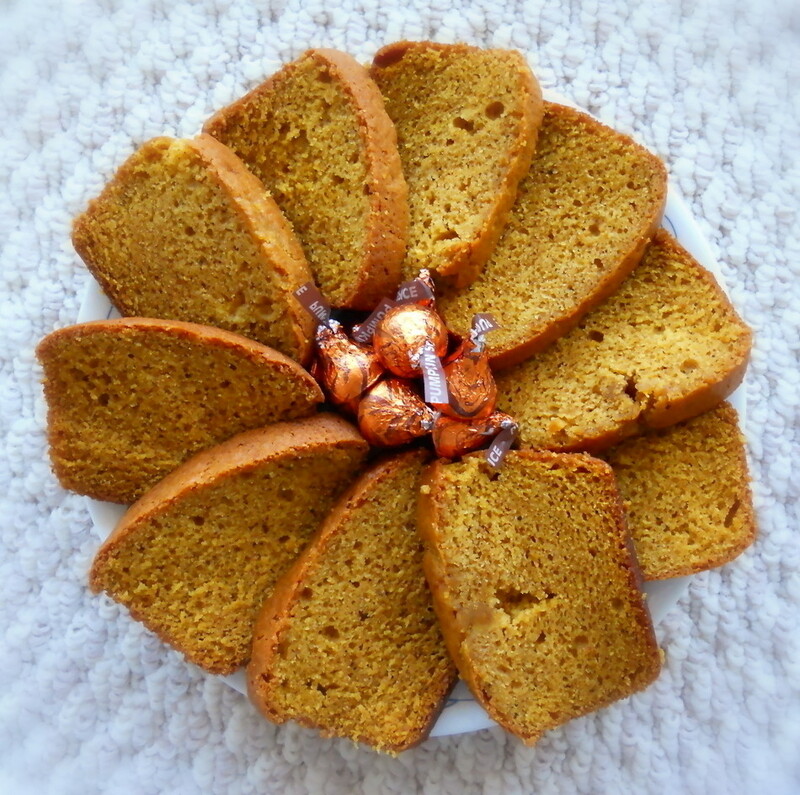 Moms Crazy Cooking "This Week's Cravings - Thanksgiving Cookies and Desserts"
Pumpkin in cornbread? You better believe it. This year, I've really been on a pumpkin kick and have been scouring the internet for new pumpkin recipes to try. This one caught my eye because it had received so many glowing reviews by other food bloggers. I figured that if they all loved it, then I couldn't go wrong. I did, however make a few changes to the recipe. I didn't have molasses or olive oil, so I just substituted them with brown sugar and canola oil. I had also read one review saying that her cornbread came out a little dry, so I added a little milk to the batter as well. The cornbread really rose up in the oven and came out perfectly golden and fluffy with a nice crusty top. I can only imagine how much better this would be had I baked in a cast iron skillet, but that'll have to wait until I buy one first. Still, even without a skillet, this cornbread was absolutely delicious. 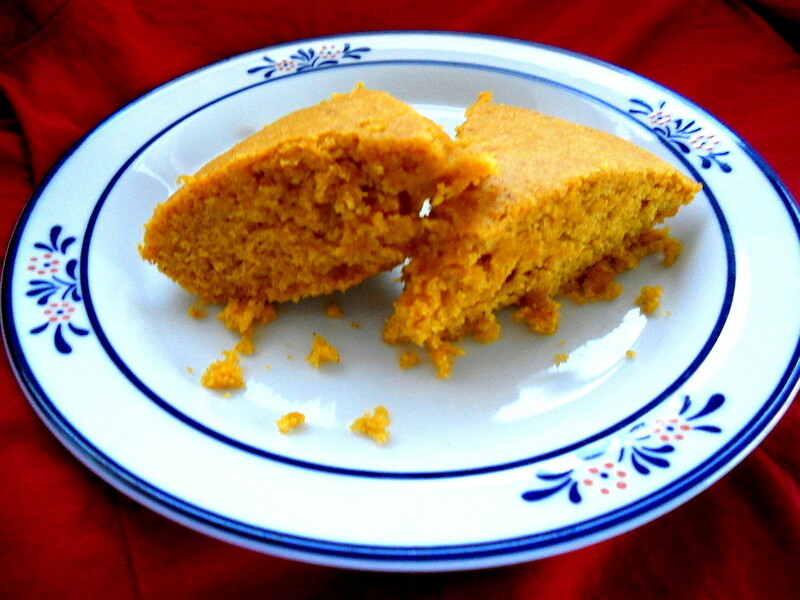 There's a slight hint of pumpkin when you eat it, just enough to give the cornbread a little special something. It's also incredibly moist, even the day after. I seriously had a hard time trying to get myself to stop eating it after my first piece. My family enjoyed it as well. 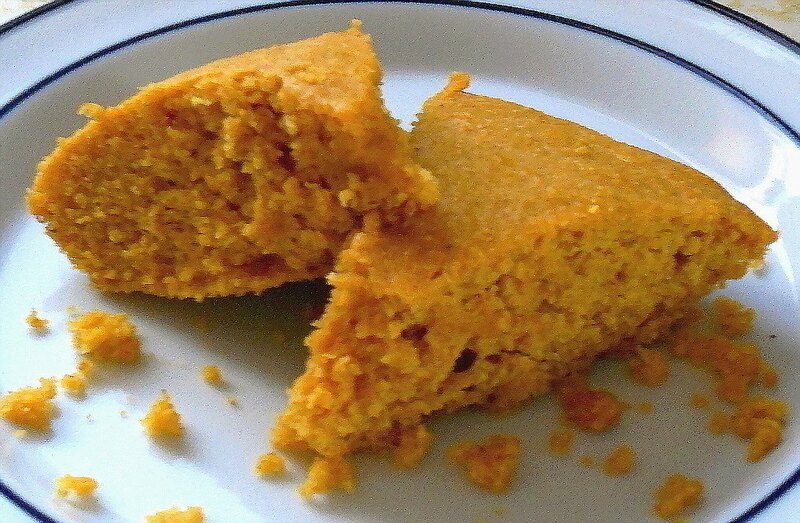 So, if you've got a lot of pumpkin and are looking for something new and delicious for your dinner table, I'd suggest you make this cornbread. Do be warned, though, it is addicting. Don't forget to enter my Giveaway here for a chance to win a $45 CSN gift certificate. Preheat the oven to 400F and grease an 8x8 baking dish (I used two 8" pie pans). In a medium bowl, whisk together the flour, baking powder, salt, spices, brown sugar, and cornmeal. In a small bowl, lightly beat the eggs, and then stir in the pumpkin, oil, milk, and molasses. Stir the wet ingredients into the dry ingredients just until combined, and then pour the batter into the pan, smoothing out the top as much as possible. Bake 30 min. or until a knife inserted in the center comes out clean. Now you have the chance to win a $45 gift certificate towards buying the one thing you've always dreamed about. All you have to do is enter. MANDATORY ENTRY: You MUST be a follower of my blog in order to enter. Visit CSN Stores and tell me something you might buy if you win this giveaway. If you do not complete the mandatory entry first, all your other entries will not count. Contest Ends Sunday, November 14th at 11:59pm PST. Good luck!